In a rematch of last season’s WNBA Eastern Conference Finals the Liberty welcomed the Indiana fever to Madison Square Garden. It was a disappointing end to the season last year when they went head on with the Fever only to fall short of a trip to the finals. The Liberty came in with a 2-3 record and were on a two game losing streak. The Fever were 3-3 on the season in what is Tamika Catchings’ last WNBA season. Catchings, a WNBA Champion, MVP, Olympian and 5- time defensive player of the year is the heart of the team and has been for many years. She looks to make one more run at another title while enjoying her farewell tour. Swin Cash was inserted into the starting line up and was productive early as she had 4 points in a little less than 3 minutes. She was assigned to Catchings on defense. Catchings is one of those players that can put her mark on many aspects of the game. She showed this in the first quarter as she had 5 points, a steal, a rebound and an assist early in the first quarter. Tina Charles fresh off her player of the month award looked to turn the Liberty’s fortunes around so that they could get back on the winning track. Charles had a very productive first quarter and so did Sugar Rodgers who had 5 points. Both teams executed well to begin the game; the Liberty had great ball movement and the early lead 15-14 with 3:26 left in the first period. The Liberty led the Fever 26-20 at the end of the first. The crowd rose and cheered as Tina Charles was announced as the Eastern Conference Player of the Month. The second quarter started off with consecutive turnovers for the home team, the Fever converted those into points and closed to within 2. Kiah Stokes had some strong plays in the second period she had 4 points and 5 rebounds. Both teams struggled in the second period as they both turned the ball over numerous times. When Swin Cash returned to the line up some of the aggressiveness returned for the Liberty. The Liberty put on the defensive clamps and went on a 10-3 run in the closing minutes of the first half. Tiffany Mitchell was productive for the visiting Fever as she had 9 points at the half. Tina Charles had 12 points while Sugar Rodgers added 8 points. Shavonte Zellous was awarded 3 free throws at the end of the half as she was fouled right before the buzzer. The Liberty led the Fever 42-29 at the half. In the 3rd the Liberty built a 15-point lead as Sugar Rodgers continued her offensive prowess. Swin Cash was still in attack mode, Shavonte Zellous was also aggressive she had 10-points at the end of the 3rd period. Zellous finished with 13 points and 3 assists off the bench. Tamika Catchings did not have a particularly strong game as New York kept her on her heels for most of the game and did not allow her to get comfortable. The Liberty took a 67-48 lead into the 4th period. They then built a 32-point lead as the bench players came in and wowed the crowd. Shoni Schimmel hit a couple of 3’s and had a few nice crossovers to bring the crowd to their feet, her teammates all celebrated on the bench. The Liberty got production from every player that entered the game it was a total team effort. The team looked together and played together. They had 22 assists on 34 field goals. Sugar Rodgers exploded tonight after a couple of sub-par games. She began the season hot and tonight the fire was burning. Rodgers held down the team offensively as she scored 21 points on 8-16 shooting. She added 4 rebounds, 2 assists and a steal. 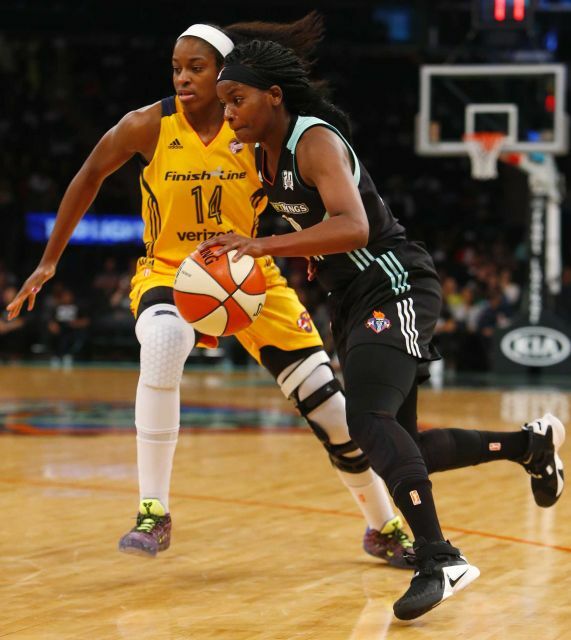 Veteran Swin Cash had 9 points, 5 rebounds and 2 steals as she was one of the focal points on defense against Tamika Catchings who never really seemed to get into a complete flow for the game, however that was not the most important thing for her last night. Tamika was just happy to be at the Garden, as she knew this would be her last time playing at the world’s most famous arena. She appreciated the love and respect she got from the players, coaches and fans at the arena. She is looking forward to playing with her Olympic teammates this summer. Catchings with all the awards and accolades still remains humble and is one of the great ambassadors for women’s basketball here and abroad. The energy in the arena was at a fever pitch; the players were energized and lively during warm-ups and in the game. The fans fed off of their energy, there was even a monster wave going around the arena. The fans enjoyed this win, and the team desperately needed it. The Liberty are now 3-3 and look to take some of this energy on the road.